One day my 3 year old woke up with an attitude. I can’t quite pin when it started but wow it has hit our household with a bang. When Little Man turned 2, I got loads of comments warning me about what was to come. Having a 2 year old it seemed would be testing and very tricky. It wasn’t. Having a 2 year old was a joy, he was great. Then he turned 3. I had no comments, no one wishing me luck for the year ahead. Why?!?! Why did nobody warn me? With my boy, him turning 3 has been a lot trickier. I have to say, the majority of times he is brilliant. He is great at playing on his own, he potty trained really quickly once we had got going and he has the most wonderful sense of humour. Some days, however the wrong side of the bed is chosen when he gets up and oh my, it’s a rough ride. Little Man has his own opinions on life now and he really does like to share them with us. Here are just a few examples. If he doesn’t like something, he growls like an angry dog. If he doesn’t want to do something, he is as stubborn as a mule and takes a lot of talking round. Gone are the days of me putting him in the corner, now he likes to put us in the corner if we have done something he is not pleased with. He mirrors everything we do. At the weekend I took the Christmas decorations down, he informed me that Santa wouldn’t be very happy with me and he would be taking back my presents. He has become the most pickiest eater at home, of course at nursery he eats anything they put in front of him. At home; one day he likes sweetcorn, another day he doesn’t. All he really wants to live on is breakfast cereal and pasta. If he doesn’t want to go to bed, he simply turns off the CBeebies bed time hour and declares how he is not tired and that he will be staying up all night. I think this might all feel a bit overwhelming right now because we have all had two weeks at home together over the Christmas break. The weather hasn’t been good and we have been in the house more than I would have liked. Little Man is happiest outdoors. We have also been out of routine quite a lot so I think he has been more tired than usual, giving him a shorter fuse. As I say most of the time, he is perfect and there is part of me that loves how feisty he is. Some days though, I get to 7pm and I’m not really sure how we got through the day. It is so hard sometimes to be the grown up and not just end up locking horns with him. Has anyone else struggled with their threenager? Ha ha my son has recently turned 4, but yes to the growling when he doesn’t like something and he has definitely got a more fussy eater as he has got older unfortunately. Three year old tantrums are few and far between but they are epic and awful – I think my son only had a couple, but I remember them vividly! Oh the picky eating, give me strength. I have three girls and this is continuing into being 5! Argh. Tell me it gets better soon. 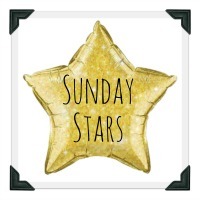 Thanks for linking up to the first #sundaystars of 2016. Hope to see you next week.